Summer is the prime time to sit back, relax, and rekindle that relationship with the neighbors. It’s the season of Fourth of July parties, graduation parties, block parties, and barbeques. No matter what kind of get-together you’re planning, there are a few simple ways to make it more sustainable! In most cases--from composting to mosquito control--hosting a sustainable event can actually be cheaper and easier than the wasteful alternative. 1. Organics recycling stations. Think of all those paper plates, napkins, and party invitations dumped into the trash bin. Each ton of paper recycled saves 17 trees, 380 gallons of oil, 3 cubic yards of landfill space, 4,000 kilowatts of energy, and 7,000 gallons of water. That’s why it’s so important to set up recycling bins and composting bins around your space. Reducing your overall waste is easiest when you plan ahead of time and focus on reusing items. You can place clearly labeled waste stations with garbage, recycling, and organics collection containers. Free downloadable signs are available at Rethink Recycling and at the Recycling Association of Minnesota. With more and more drop-off sites and curb-pickups coming to the Twin Cities, it's easier than ever to dispose of your organics. If you live near St. Paul, the city even offers special containers for your event to help you set up your own easy composting and recycling stations! Contact your county's recycling department or community council to see if bins are available in your area. St. Paul reserve event containers. Ramsey and Hennepin counties will check out recycling containers for events. 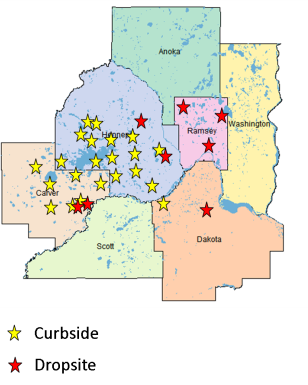 Details about their programs can be found at their respective websites for Ramsey County and Hennepin County. What are organics? 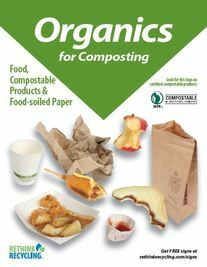 Organics include all food scraps (fruits, veggies, bread, eggshells, coffee grounds), food-soiled paper, (tissues, non-plastic lined bowls, pizza boxes, napkins) and certified compostable plastics. Unlike small-scale or backyard composting, commercial organics recycling facilities are designed to handle large volumes of material, so they process meat, dairy, bones and non-recycleable paper. Unfortunately, the following items are still not compostable in most counties: StyrofoamTM, pet waste, dryer lint, and items with cleaners or other chemicals on them. If you include paper products in your organics recycling, please make sure they do not have a plastic lining. Be sure to check with your local hauler and county/city website to find out what is accepted in organics programs near you. For more general information, check out this list of what is/is not suitable for organics recycling. What if I want to buy compostable dishware? The Biodegradable Products Institute (BPI) maintains an online catalog of the various products they have certified. The catalog is searchable and you can download the individual items for a given company. Local facilities will also take anything that has been certified by Cedar Grove Organics Recycling. Their catalog can be found here. Another good option is Litin Paper. Most co-ops also carry compostable items; just check for the BPI or Cedar Grove label. Where do I bring my organics recycling? Some cities, like Minneapolis, will soon have citywide organics recycling, and a number of other cities are adding drop sites. Please check with your local municipality or service provider to confirm if, how, where, and what organics materials you may be able to recycle. Some programs may be free, while others will have a cost for service. And, you can always start your own backyard compost! The following cities have curbside organics collection (some may depend on individual hauler): Bloomington, Carver, Chanhassen, Chaska, Cologne, Victoria, Waconia, Watertown, Burnsville, Eden Prairie, Edina, Loretto, Maple Plain, Medicine Lake, Medina, Minneapolis, Minnetonka, Orono, Shorewood, St. Bonifacius, St. Louis Park, Wayzata, Hutchinson, Elk River. 2. BYOP (bring your own plate). Provide reusable or compostable plates, cups, silverware and linens, or ask your guests to help contribute dishware! Using reusable and washable items is always the best choice whenever feasible. 3. Ditch the balloons. Consider buying an alternative decoration (like native flowers)! Try to decorate only with items that could be reused, recycled or composted, instead of thrown in the trash at the end of the night. 4. Drink up. If you provide separate recycling containers for empty cans and bottles, you can go one step further by buying bulk-size containers and asking guests to bring reusable cups or mugs. 5. Eat local. Eating local food is easy to do with summer farmers’ markets, co-ops and blooming neighborhood gardens. Eating locally reduces the amount of fuel needed to grow, package, and transport the food, especially when we think of how the average meal travels 1,500 miles to make it to our dinner tables. Try turning your special event into a potluck, or ask your guests to each contribute an item from their gardens. For a directory of locally-produced products and vendors, see Minnesota Grown. 6. You’ve got mail. Elect to email invitations when possible to reduce paper waste. It’s also a great idea to tell your guests in the invitation to bring their own food for the potluck or dishware, or at least to share how sustainability is a goal of your event! 7. Pass the ketchup. Always buy condiments in bulk to avoid those pesky individual wrappers. Buying food in bulk is an easy way to create less packaging as well! 8. Bring a doggy bag. Remind guests to bring reusable containers so they can take leftovers home. Otherwise, you can gather the leftover food and take it to a compost dropoff site or to Second Harvest Heartland if it follows their guidelines. 9. To cycle, or not to cycle? Encourage walking, biking or public transportation by including a link on “how to get there” in your invitation. 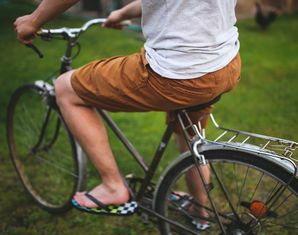 Information on bike routes or bus passes will encourage guests to travel sustainably. 10. Bzzzzzzzzz. Mosquitoes can make or break an outdoor party, but there are surprisingly effective ways of managing them without breaking out the DEET. The EPA considers DEET and picaridin “conventional repellents” and oil of lemon eucalyptus a “biopesticide repellents.” Lemon eucalyptus oil has been used since the 1940s as an insect repellant. The Centers for Disease Control and Prevention (CDC) has approved eucalyptus oil as an effective mosquito repellent. A recent study showed that a mixture of 32 percent lemon eucalyptus oil gave more than 95 percent protection against mosquitoes for three hours. All you need to do is mix one part lemon eucalyptus oil to 10 parts sunflower oil or witch hazel. (Not recommended on children under 3 years old). 11. Burn baby, burn? For many of us, summer means bonfires. Wood is natural, but wood smoke can be unhealthy for you and those around you. Burning wood in the backyard eliminates the “smokestack” that normally releases particulate matter and dioxins away from ground level. This means that you inhale more toxins. Wood fires can make bad air days worse, and some communities in Minnesota have adopted ordinances to restrict backyard recreational fires or prohibit fires if the air quality index is above 100. However, there are healthier alternatives. For example, you can try bioethanol, natural gas, or logs that are made of renewable resources and release 80% fewer emissions! Natural gas is a cleaner fuel choice than wood in terms of the emissions of fine particles and many other air pollutants. If you do burn wood, make sure that it is dry and well-aged. For more information about backyard fires, and clean wood storage, click here. 12. Say cheese! Take photos of the trash/recyclables/compost you generated and send them to your guests in a follow-up thank you email. Be proud of how much waste you diverted from a landfill together! Water/Ways traveling exhibition: Grand Opening June 25th! Water/Ways is a traveling exhibition and community engagement initiative of the Smithsonian Institution’s Museum on Main Street program. It's first stop will be the Prairie Woods Environmental Learning Center in Spicer, MN starting on June 25th. Water/Ways is led by the Minnesota Humanities Center in partnership with Minnesota Pollution Control Agency, Minnesota Historical Society, Minnesota Department of Natural Resources, Minnesota Department of Health, Minnesota section of the American Water Works Association, and the 6 communities in greater Minnesota to which the exhibits will travel! We Are Water is an interactive story collecting exhibit that focuses on individuals’ relationships with and responsibilities to water. The exhibit includes stories from people reflecting on the meaning and experience of water in the state of Minnesota as a whole, stories from people local to a host site community, and space for visitors to the exhibit to add their own stories and images. How’s the Water? focuses on water quantity and quality and Minnesota’s unique position as the source of three major U.S. watersheds. Exhibit-goers learn about overall conditions of Minnesota’s lakes, rivers, streams, groundwater, and water infrastructure. How’s the Water? also raises awareness about health equity issues and water in our state. The exhibit then connects Minnesotans to solutions, providing ways to sign up to be a citizen scientist, use water sustainably, and manage runoff.